This is part two of a three-part series about how CIPE is empowering women around the world. You can view part one here and part three here. FWEAN Board, chapter, and general members pose together after a National Consultative Workshop to identify economic issues to address with the government of Nepal. After years of policy advocacy by the Federation of Women Entrepreneurs’ Associations of Nepal (FWEAN) and other associations, the government of Nepal launched a loan program in 2015 to support women entrepreneurs. The objective of the loan program, called the Women Entrepreneurship Development Fund (WEDF), is to provide access to credit at a subsidized interest rate to women business owners. Although the loans provide a unique opportunity, many Nepali women entrepreneurs do not apply for them. To find out why application rates were so low, FWEAN held three roundtable meetings involving key stakeholders including association members, NGOs, banks, government officials, and business organizations. At the meetings, FWEAN discovered that the maximum loan amount of approximately $5,000 USD was insufficient for women entrepreneurs to grow their businesses. Costs of raw materials and expansion easily exceed that amount. Because a small loan is suitable only for very small businesses and does not permit existing women entrepreneurs to expand their businesses, many FWEAN members do not see the value in applying for the loan. Basu Maya Tamang opened Timur Chhop, a hot pickle business, in Kathmandu in 2010. Raising the low ceiling on business loans for women would allow Tamang to make the necessary upgrades to grow her business. 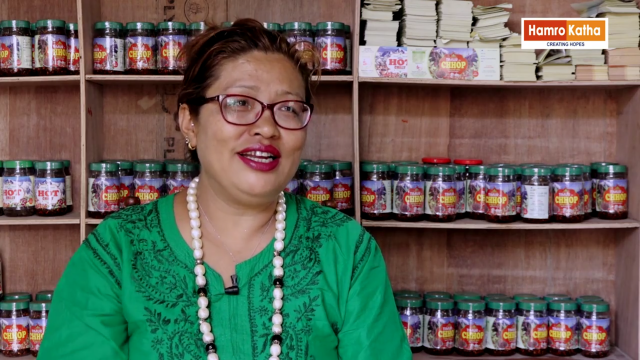 Basu Maya Tamang is one of the seven Nepali women entrepreneurs who received a WEDF loan equal to roughly $4,000 in 2017. After struggling for years in the construction and manufacturing sector, she opened Timur Chhop, a hot pickle business, in Kathmandu in 2010. Since then, the business has gained popularity in Nepal and abroad (United States, Australia, and Japan). However, her manufacturing center is poorly suited to keep up with demand. Tamang wants to upgrade the facility by constructing two-story metal frame structures that would cost the equivalent of $17,000. Instead, she has had to use inferior zinc sheets because the WEDF loan is too small. Raising the loan ceiling would allow Tamang to make the necessary upgrades to grow her business. Additionally, FWEAN identified an overall lack of awareness of the loan program and a lack of clarity on how to apply, as well as who is eligible. Women entrepreneurs said the application process is lengthy and cumbersome, taking more than a year in some cases. Monitor the loan program through all stages to ensure effective implementation. Roundtable participants expressed their support for scaling up the WEDF loan program and agreed to remain key allies throughout the policy advocacy process. Building on this momentum, CIPE is now supporting FWEAN in policy advocacy efforts to enhance the WEDF loan program. CIPE will also support FWEAN as it conducts capacity-building workshops to heighten awareness among women entrepreneurs about the WEDF program and how to apply for the loan. CIPE’s new Center for Women’s Economic Empowerment views this initiative as a model for groups seeking to enhance women’s loan programs around the world. The Center was founded on the belief that economies prosper when women entrepreneurs have a voice in shaping laws and policies that govern their businesses. To this end, the Nepal project has succeeded in giving women entrepreneurs a voice and paving the way to dialogue between business and government. Over the years, CIPE has supported FWEAN in engaging and representing women in business and implementing gender-focused policy advocacy. Today, FWEAN represents Women Entrepreneurs’ Associations in Nepal with over 3,000 individual members across the country. The organization’s mission is to promote women entrepreneurship through advocacy, networking, information dissemination, and capacity building. Morgan Frost is CIPE’s Assistant Program Officer, Global Programs.